Home » The Good Systems Blog » Salesforce » Why Salesforce? Here at Desynit we champion great systems, and we think that Salesforce is up there with the very best. But why? What is it about Salesforce that has so inspired us? And more importantly, what could it mean for you and your business? We thought we’d attempt to put our excitement down in words. Salesforce is a cloud-based CRM that can turbo-charge your business relationships and transform the working lives of your team. Developed by Marc Benioff in the late 90s and now heralded as the world’s most innovative company, Salesforce wanted to make enterprise software as easy to use as a website and available to all. A lofty goal but does it deliver? We think the answer is a resounding yes. 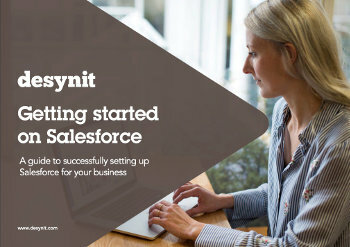 We’ve witnessed the transformative and freeing effects of Salesforce first hand here at Desynit. It is the tool we choose to use to manage our customers’ experience. For a small, growing business like ours Salesforce is an investment – one that we didn’t take lightly. It has more than paid off. With careful thinking and tailoring we’ve seen a gratifying increase in lead volumes, conversion rates, win rates, revenues and customer retention. And it has freed up a lot of our precious time too. Here are 5 reasons why we use, recommend and choose to implement Salesforce for our clients. With Salesfore as your CRM, your sales, marketing, and customer service teams can understand every customer and deliver the right message or answer when they need it. By analysing this information, you can make better decisions to close more business, reduce the cost of service, and keep every customer satisfied. CRM is shifting toward cloud computing and Salesforce.com is a leader in cloud computing, offering a complete set of CRM cloud applications, a cloud platform, and a cloud infrastructure – more cost effective for a higher return on investment. Salesforce gives you complete freedom to customise the CRM for your business. It’s the best way to boost adoption and make sure your CRM apps are working the way you do. 4. We love the AppExchange! Salesforce also has the AppExchange – the number one destination for great pre-build business applications – for your CRM and beyond. This is the cloud-computing app marketplace for businesses, developed and hosted by Salesforce. You can get access to thousands of useful, secured and verified applications built by others, or you can even develop and market your own. 5. More than a CRM – a joined up customisable platform for your business so you can make it work like YOU want it to. Not just a CRM; it’s a cloud-based platform – a complete IT infrastructure for your business hosted on their servers on top of which you can build bespoke applications to suit your business requirements. You can use Salesforce for just one thing or as a joined up platform for all that you do: a contact management system; a way to manage your sales pipeline; your marketing machine; finance management system? With Salesforce it’s up to you. And here’s what Salesforce can bring to your team. What does Salesforce mean to your business? Better customer management for great customer experiences; with data at your fingertips means you can learn and constantly improve; improved efficiency, increased productivity, Salesforce makes it easier for your business to sell more and grow. Have we convinced you? Do let us know. You’ll find plenty more information over on the Salesforce website. Want to know more about how to make Salesforce work for you? Fill in the form on this page and download our Salesforce SMB Implementation Guide, read some of our customer stories or get in touch with us today.